In addition to conducting his own classes and trainings, Woody is recognized internationally as a Master Trainer of Conflict Resolution Trainers. In 1999, the Western Justice Center in Pasadena appointed Woody to serve as Convener for an international symposium on training that involved such training luminaries as Jay Folberg, John Wade, Josh Stulberg, Lela Love, Maria Volpe, Peter Salem, and Robert Baruch Bush. Woody was also requested to serve as Guest Editor of the Family Court Review’s Special Issue, Training Mediators in the 21st Century” (January 2000) featuring articles from participants in the symposium. For many years, Woody teamed up with Lela Love and Josh Stulberg to offer a popular Training Mediators Workshop at the annual ACR Conference attended by professional mediation trainers and professors of conflict resolution. Woody was Chair of the Academy of Family Mediatorss Consultation Institute and has offered Training for Trainers at his institute in Los Angeles and most recently for the Swiss Bar Association in Zurich. In order to provide hands on education and mentoring for the conflict resolution trainers of the future, Woody offers a Training Internship as Assistant Trainer for every 40 Hour Basic Divorce Mediation Training offered in Los Angeles at his home. Selected by application and phone interview, the Trainer Internship is for those experienced Mediators and Collaborative Professionals who have either started to give trainings or who have a deep commitment to become a professional trainer in the near future. Trainer Interns receive hands on mentoring from Woody in training design, module objectives and preparation, presentation, observation and feedback of role plays, and managing the many challenges that occur during a five day training. Each Trainer Intern is offered the opportunity to present a 30 minute module on the 5th Training Day. For a review of the experience from the perspective of a Trainer Intern, Read More. Trainers receive a full tuition waiver for the training course and supervision and are responsible for their own travel and housing expenses. Past Training Interns include Helen Collins (West Cork, Ireland), Tom Darnton (Ann Arbor, MI — Tom enjoyed the experience so much that he came to LA twice to serve as Training Intern!! ), Christian Hartwig (Berlin, Germany), Ken Reed (Past President, Southern California Mediation Association), Kimberly Fauss (Richmond, VA), Glenn Gottlieb (Los Angeles, CA), Kevin Scudder, (Seattle, WA), Michelle Baxter (Westlake Village, CA), Elizabeth Potter Scully (Los Angeles, CA — Liz was so good that she is now my faculty assistant for the Mediation Clinic at UCLA School of Law and she is my co-author for the 2nd Edition of The Complete Guide to Mediation (ABA Forthcoming in 2015). “I was lucky enough to be chosen as an “Intern” to train in delivering Divorce Mediation Training in September 2011 by Professor Forrest Mosten, renowned Lawyer, Mediator and Teacher at UCLA School of Law in Los Angeles. In mid September I packed my bag and headed off into the unknown! I was welcomed into a class (restricted to 18 in number), the majority being experienced trial lawyers (from many parts of the US) and the remainder being established Mental Health Professionals. Forrest’s Trainings book out six to twelve months in advance. We worked hard together for five very long concentrated days and grew to know each other better during that time. Forrest encouraged me to talk to our students on day five, about my experience and family background and how I had, to date, travelled the road of conflict resolution. I found myself giving a brief outline of the Irish War of Independence, the burning of my father’s house by the Black and Tans, the signing of the Treaty, the Civil War and the death of Michael Collins. I told of my father’s ability for forgiveness, his passion for reconciliation and his service to his clients and his fellow human beings – the more vulnerable the more determined was his protection. I spoke of my 35 years as a Solicitor and the traumas, deaths and suicides I had experienced. We all have our story! We are the culmination and more of the tapestry of our experience and the experience of those who came before us. As I stood in the LA classroom telling a little of my story I saw the many successful Lawyers sitting in front of me… there to learn a different way… ready and wanting to step out of the adversarial Court System… to become peace makers! Our teacher, Forrest Mosten, renowned Lawyer said an absolute “No” to litigation and stepped out of Court many years ago. I learned from Forrest that the statistics confirm that 90 per cent of Family Conflict settles in private Mediation – 60 per cent in Court directed Mediation. As Lawyers we have the power to strongly encourage and proactively work with our clients to make family focused processed choices such as Mediation and Collaborative Practice. It is argued that family conflict is 80 per cent emotional and 20 per cent legal. We have skilled “Coaches” available to us to emotionally support and educate our clients. We have the “options” and we have the “tools”. 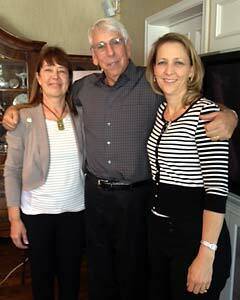 “How privileged I was to be Woody Mosten’s intern at his January, 2014, family mediation training in his L.A. home. Each part of the experience was enriching: participating along with the other students in role plays and discussion, conferring with Woody about his pedagogy, coaching students and facilitating discussion, and presenting a discrete module of my own on the final day. Observing Woody’s training would have been enough; sharing in the work and receiving his gracious feedback was a bonus. What an outstanding learning experience! “Woody is a master trainer, an ability honed in his many years of helping to define the family mediation field as we know it today. There seems to be nothing he hasn’t confronted, no complexity he hasn’t helped to untangle. His skill is humbling, and his commitment to peacemaking is inspiring. Having already transitioned my own practice to mediation, Collaborative Law and unbundled services in recent years, I now embark on the post-Woody phase of my professional life, in which I expect the clarity of my vision will be sharper, my skills will be better refined, my curiosity will be more acute, and my clients will be better served. I was fortunate to have had the privilege of working with Woody earlier this when I served as his assistant trainer in South FL (my community) in his outstanding 2-day course “Developing a Successful Collaborative Practice.” I facilitated the details and was invited by him to “present” a few modules. I never experienced my fellow practitioners so lit up. This was tremendously gratifying for me to see and was wonderful being “partnered” with Woody in this endeavor. So, when he asked me be his trainer/intern in this 40-hour mediation course, it took me one second to say YES! I had a feeling that this extended training with him might be even more impactful for me, but in reality it turned out to be in a universe of its own. Throughout the week Woody provided me with the opportunity to mentor participants in the class during their break-out sessions which was a uniquely profound learning experience for me. Through my observations with and suggestions to the students, I realized that I was truly able to confer benefits upon them as a trainer for which I received tremendous gratification. Just as valuable to me, were the new insights and knowledge I received through observing and addressing their process-related inquiries. I watched Woody attentively during the week as he mindfully and patiently taught the participants in the class through his Socratic method (drawing out responses/answers from the audience, assuring that the participants were continuously engaged, and actively participating). The training participants play an integral role in his pedagogical process as he uses training as a metaphor for actual work in the mediation room. Prior to serving as a Trainer/Intern , I had only given conference and practice group presentations and speeches. Now, I was learning to be a conflict resolution trainer which is a totally different role. For the first time I was able to truly liveout the distinction in a knowing kind of way and to appreciate how much more difficult this was. My principal objective during the week was to absorb Woody's mediation style and essence through his modeling behaviors. So, on the last day, when I was asked to take over the morning session of the training I had no idea how much had actually sunk in. Could I indeed do this? Suddenly, I was the trainer in the room. I then understood that only by stepping off the plank will you ever know how you will land, and thank goodness Woody didn't ask if I was ready. He just told me to take over, and luckily I felt I had no choice because I doubt I would have willingly jumped. This was an experience of a life time for me and I wholeheartedly recommend serving as Woody’s Trainer Intern to anyone who may be invited to serve in this role. My Week with Woody, Jody and the Peacemakers. After over five decades on this planet, over three decades working in law firms and the legal services industry, and over two decades of searching for a way to practice law with a mindset that is about healing and not destruction, I find myself stranded on a bench in the sun at LAX due to a snow storm preventing any airline from delivering me back to my current home in the Midwest to start a multi-day custody trial.Lacking clear guidance on how one should or might act or think under these particular circumstances, I'm left with much time to ruminate.So with four (possibly more) hours until the next scheduled flight, weather permitting, I have taken my IPadMini and stylist in hand to attempt to put into words my experience this past week in Westwood, California, serving as assistant trainer with my mentor and friend, Forrest "Woody" Mosten. For those who have not yet experienced Woody's 40-hour mediation training, let me first described the setting for the week.Lawyer, mediator, peacemaker, Woody, and his therapist wife, Jody, turn their beautiful family home, on a tree lined street near UCLA, into a mini-campus for five days.Twice a year they host 18 professionals all seeking to explore, expand or start mediation or peacemaking practice.The students and assistant trainers gather in Jody and Wood's family room - converted to a classroom complete with white boards, projector, screen and gong from Tibet used to make the passage of time.The Mostens' patio, garden, dining room, home offices and hallways become breakout spaces for role-plays, debriefs, peacemaking circles and mealtimes. Over the five days the students take a fictional divorcing couple, Linda and John, from conflict to resolution - from turmoil to peace. The students and assistant trainers come from various disciplines and industries - law, mental health, finance, nursing, business, real estate and even the arts.The trainees and other assistant trainers I was privileged to work with over the five days included accomplished litigators, a cardiac psychologist, a financial planner, and a lawyer turned one-women stand-up performer.Their paths to Woody's home-classroom may be varied but on the first day it became clear quickly that the reasons for being there are quiet similar.The students, bar none, are life long learners in search of ways to live and serve those looking for ways out of conflict.Some of the participants are themselves products of devastating family conflicts - one student poignantly shared how at the age of six she was made testify in her grandparents divorce.Others shared about the "scorched earth" proceedings they, their families, their friends or their clients experienced in courthouses around the country - a few of those proceedings ending with suicide or years of dysfunction for the children or the extended families. I have participated in and have presented at similar professional trainings over the last twenty years. Typically these types of programs start with the trainer going around the room having the participants introduce themselves to the group.However, from hour one Woody turned the introduction task into a learning and sharing opportunity.Students were divided into pairs and sent to the various breakout spaces for 20 minutes to interview one another - using only open questions.When the large group reconvened each one of the pair introduced the other for one minute summarizing the highlights of the other's life, journey, professional and personal experience.This exercise helped with honing listening, reframing, questioning and reporting skills essential for all proficient mediators.This exercise was a wonderful ice-breaker and created an atmosphere of immediate intimacy with participants not merely sharing their "rank and serial numbers" but also sharing one-on-one details on topics like family, faith and philosophy. Each morning the students were assigned different seats in the classroom and each role-play allowed students to rotate roles between the mediator, each of the clients, the observer and the reporter.This created a kaleidoscope of perspectives and allowed a simulation of the real world where each family, no matter how similar their circumstances, are unique systems needing individualized attention and tailored outcomes.Break-times and lunchtime (all lovingly curated by Jody Mosten) became gatherings of camaraderie, sharing, and laughter for students and trainers alike.We read aloud, we joined, we literally took baby-steps to the bench in the front yard, we sat in silence, we danced, we learned to mine for needs and interests, we learned to step away when that is the best technique to improve communications between bickering parties.The hours flew by and the flowering of knowledge, friendship, personal and professional growth was amazing to witness and to be part of.The closing ceremony, facilitated by Woody around his family’s outdoor dining table (based on an Quaker sharing circle using an indigenous talking-stick) brought expressions of deep gratitude, of hope, of renewal, of love and of dedication and re-dedication to the healing art of peacemaking and conflict resolution. For now I am still stranded on the bench at LAX awaiting my return to frozen tundra of the Midwest.But I am warmed, not only by the sun, but by the joy of knowing that because Woody so wholeheartedly shares his home, his knowledge and his wisdom there are now eighteen more professional peacemakers on this planet.Eighteen new friends and list-serve buddies who are committed, as I am, to genuinely helping families and individuals looking to pivot away from conflict and toward healing for themselves, their children and the generations to come. Serving as Woody’s Assistant Trainer Intern for his September 2015 40-hour Basic Mediation Training was truly a highlight of my professional career, which met my goals of honing my skills as a trainer, facilitator, speaker, mediator, and collaborative professional. I whole-heartedly recommend that all individuals who have similar goals as mine to consider applying for Woody’s Assistant Trainer Intern position. In this role, Woody will support you through the process of developing core training skills, and, at the same time, stretch you beyond your comfort level, which he consistently does with everyone in his workshops. That makes for such a rich learning and growth experience for all participants. On the final full day of the training, Woody invited me to lead facilitating the workshop for the entire morning. This included presenting a training module for the class. I presented a very condensed and customized version of Woody’s 2-day course on “Building a Profitable and Satisfying Peacemaking Practice.” In my utilizing Woody’s practical methods and practices on how to translate a passion for peacemaking into a profitable full-time professional career, I was able to build a very fulfilling 100 percent peacemaking practice in less than one year, and my revenues continue to climb exponentially and beyond my wildest earlier expectations and forecasts. I humbly attribute much of my success to Woody’s sage advice, which not only can be found in the content in Woody’s 2-day course, but also is generously available in numerous additional places, such as on his website, www.mostenmediation.com, and also in his books, articles, and videos on how to develop a full-time peacemaking career. My training module was very well-received by all. I still had much to share with the class before I needed to close and move on to the next training module; however, in a short amount of time and by summarizing some key steps, along with Woody, I seemed to have further energized and inspired many in our class to commit to doing more mediation back in their offices at the conclusion of our training. That is an overall goal of mine – as a trainer in the important and relevant work of conflict resolution, I find much joy in connecting with others who share my passion for peacemaking. I will commit to supporting them in their endeavors to make a fulfilling living doing what they love. Like Woody did and is doing for me, I would like to pay it forward for others who want to practice full-time peacemaking and re-assure them that if I can do it, that they could do it at least as well as, or even better than me. I am still riding high from my week of mediation training with Woody Mosten. The opportunity to train with one of the greatest peacemakers in the world was the opportunity of a lifetime. Woody and his wife, therapist Dr. Jody Mosten, hold these semi-annual mediation trainings in their beautiful home in Los Angeles. Last week, I was given the opportunity to assist him in his training for five magical days. From the minute I walked in the Mosten home on that first morning, I could understand why these trainings are sold out months in advance. There is a warmth and energy that greets you at the door and never leaves your side throughout the week. The eighteen trainees from five different states gathered throughout the house and immediately began to share their stories. Woody and Jody had already begun to create an atmosphere that will eventually convert a house of strangers into longtime friends. At 8:30 a.m. sharp, Jody sounds the gong and the trainees take their seats in the Mosten family room. Although the family room furniture is stacked in the garage to make room for tables, chairs and flipcharts, the room has lost little of its warmth as the California sun flows in through the sliding glass door leading out to the patio. Woody stands up and greets us all with his immeasurable generosity and grace, going out of his way to extend his compliments and praise to everyone in the room. Within minutes, he turns the focus over to the trainees, giving them the chance to bring even greater intimacy to the room through their unique stories. When all of the introductions are completed, Woody begins to take us on our journey through his mediation world; not with long lectures and pompous declarations, but through gentle nudges, engaging stories, wise observations, and personal connections. By the end of the first morning, everyone understands the charm and wisdom that has made Woody Mosten one of our great peacemakers. His generous smile and his true interest in the other people in the room is enough to send conflict running for shelter. Throughout the next five days, we were taken on a journey filled with Powerpoints, flipcharts, role-plays, laughter, and learning. At each stage, the talk focus on “John and Linda” a fictional divorcing couple facing many of the troubles we all see in our offices each day. Skills are taught, practiced, improvised, and practiced again until unfamiliar new ideas begin to take shape and impact our work. In what seems like an instant, the 40 hours of training came to an end and we found ourselves sitting in a large circle in the Mosten backyard, looking back on the past few days. Strangers had become close friends, novices had become enthusiastic learners, and old hands (like me) had become reenergized. As we prepared to part ways, gratitude was expressed all around and laughter (and even a few tears of joy) spread through the circle. Woody and Jody sat at the end of the circle, accepting the praise and gratitude but, as always, reflecting the attention and accolades back to the trainees. As I sat there, wondering where the time went, looking back with gratitude on a truly transformational week, I reflected on the impact that this week had on me personally. While teaching with Woody may have helped bring out the best teacher in me, I was more impacted by my role as a student. Watching Woody do his work, and seeing him bring out the best work in eighteen other people, has enriched me as a peacemaker, and as a person. Woody has become a dear friend, as well as a mentor, and has left a lasting impact on my work. I am eternally grateful for this opportunity. When I was accepted to serve as Woody’s intern trainer for his 2016 40-hour mediation course, I was elated! I knew others who had either attended or served as an intern for the course, and all said it was quite an experience. Further, I was just beginning my own training career, and so I looked forward to learning Woody’s training techniques. When I arrived from Tampa to Los Angeles, Woody and Jody made me feel right at home. They took me out for dinner, told me stories from prior trainings, and prepared me (or so I thought) for an eventful 40 hours. I arrived early at their home the next morning for the training. It is then that we began what I learned would be our morning ritual for the next several days: take a leisurely stroll with Woody and Jazz – the Mosten’s Katrina rescue dog – around the neighborhood. Having the opportunity to simply hang out, ask Woody questions, and listen to how he built his peacemaking practice was a pleasure and an honor. And then the training began. I had already conducted a 2-day introductory collaborative training, and had attended quite a few collaborative and mediation trainings, so I thought I had a pretty good grasp of available teaching techniques. Boy, was I wrong! Day after day, Woody would surprise attendees (and me) with new and innovative learning strategies. There were even a few times when, if the neighbors did not know Woody, I’m sure they would have wondered what the heck was going on in his yard! I could barely take it all in, and I still review all my notes as I incorporate Woody’s techniques into my own trainings. Woody is a pioneer in unbundled legal services, collaborative law, and mediation, and yet he comes to his training with the excitement and passion of a new law graduate. His energy and joy for training is truly contagious, and I hope that when attendees at my trainings look at me, they also see a bit of him. I cannot recommend Woody Mosten’s 40 Hour Basic Divorce Mediation Training enough. As the Assistant Trainer during his January 2017 session, I walked away grateful, inspired, and exhausted! As a person who teaches mediation, I appreciated the fact that Woody used various methods to introduce and reinforce different concepts, ranging from active listening to asset division. In fact, I plan to implement a few of the methods he used during the training (however, no one can match Woody’s one-of-a-kind personality that he infuses into his teachings). Further, this mediation training is set apart from countless other mediation trainings by its thoroughness in the mediation process. Professor Mosten explored the entire mediation experience, from intake to final agreement, and he had the students act out the entire process with each other. That experience alone goes a long way in setting them up for a focused and fruitful mediation practice. By the end of the training, the sense of camaraderie between the students was profound. People left the training feeling inspired and informed. I thank Woody and his wife Jody for their hospitality by opening their home and their hearts to me and the rest of the students for his amazing mediation training. I would encourage prospective mediators to take this training and any other training that Woody Mosten provides. Assisting Woody Mosten in training a new group of divorce mediators has been a privilege and an honor. Woody was endlessly supportive and encouraging, both for those just learning mediation skills and for me as I began to comprehend what is involved in training mediators. Woody’s modeling of many skills and nurturing them in role plays was wonderful: building trust; listening actively; reframing communications; normalizing the distress and anxiety associated with divorce; slowing clients down so that they take one baby step at a time in a constructive direction; showing empathy; clarifying issues; noting and building on small successes; asking well-planned, helpful questions; affirming what a client says and, with the client’s permission, adding something to it; moving people away from their positions and into their true interests; interacting with people respectfully; clarifying confusing communications; moving people away from blaming and into problem-solving; empowering clients; nurturing creativity; and so on. One thing I loved was the way Woody taught all of these skills metaphorically. Over and over, how he interacted with the people in training was the way a skilled mediator interacts with clients. For me, this framework was a new way of thinking about training. Woody’s pacing of the activities was also excellent. It provided me with a great model of what I might someday do, mixing teaching, observing, role plays, videos, discussions, and breaks so that participants never get worn out or bored. Copying Woody, I might even include a toolbox demonstration! The breakfasts, lunches, and snacks Jody Mosten provided enriched the training, too. Conversing together about anything and everything while eating helped all of us to relax and bond more than I have seen people do in other trainings. It is not possible to say and do everything that could matter about divorce mediation in just one 40-hour program, so Woody provided a comprehensive manual and introduced us all to excellent books about how to mediate family issues. The way Woody drew me into the training, inviting me to share my experiences and my usual ways of doing things as alternatives to his usual ways of doing things, was also great, as was his encouragement for each member of the class to develop his or her own way of conducting divorce mediations or other peace-building practices. He helped me to discover that I know more than I thought I knew and can share it in ways that are useful to new mediators. To my surprise, this internship helped me to became comfortable and confident in coaching people about things they could try and in providing feedback about their efforts in role plays. I am forever grateful to Woody for this opportunity.